It has been a few years since I took a Wilton cake decorating course at my local Michael’s so I felt it was time to dust off my box of cake decorating paraphernalia and practice my piping. I also decided it was a good time to try a new cupcake recipe. This recipe from Williams-Sonoma resulted in moist cupcakes that I am pretty sure I will make again. It yields 12 cupcakes, which is perfect for me because I don’t want any more than that hanging around! For detailed instructions please visit Williams-Sonoma. This simple recipe makes a great base. For more adventurous cupcake lovers you could add some lemon zest or almond extract, or you could dress them up with frostings of various flavors. My husband prefers his cupcakes unfrosted as he finds most frosting too sweet. 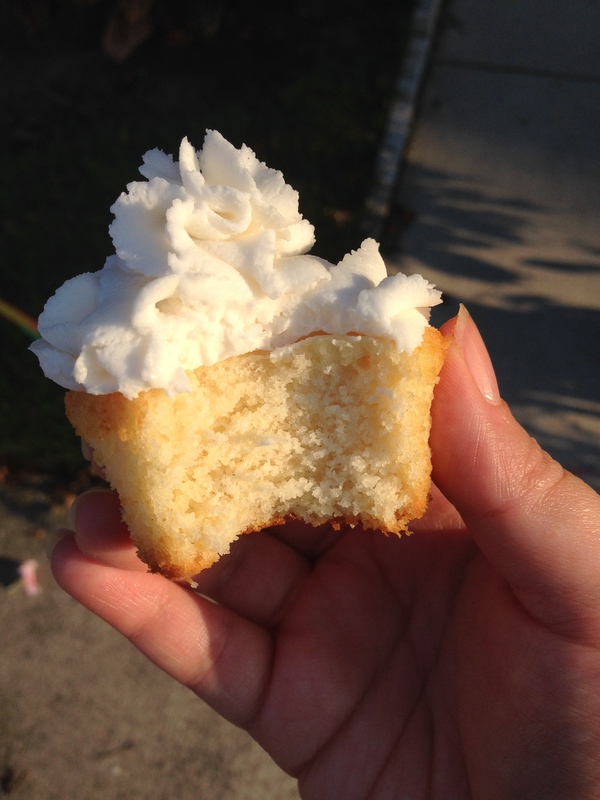 I made plain buttercream frosting and scaled back a bit on the sugar. The result were cupcakes that were not too sweet but still a treat to eat. 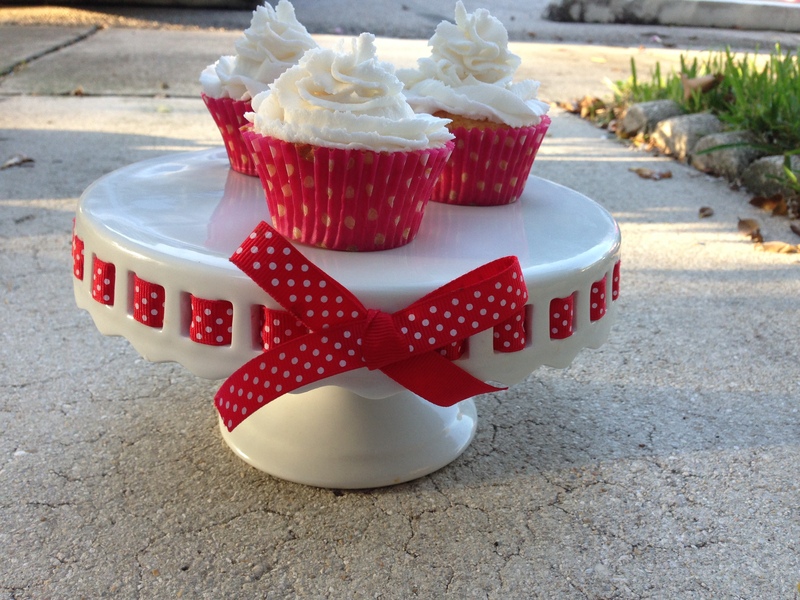 Posted in Recipes and tagged cupcakes, recipes, vanilla on August 24, 2014 by abbydlr. Posted in Uncategorized on August 19, 2014 by abbydlr. Content warning: the following post deals with the topic of mental health and mentions suicide. “Every day may not be good, but there’s something good in every day.” I am not sure who said it first, but I love that quote. 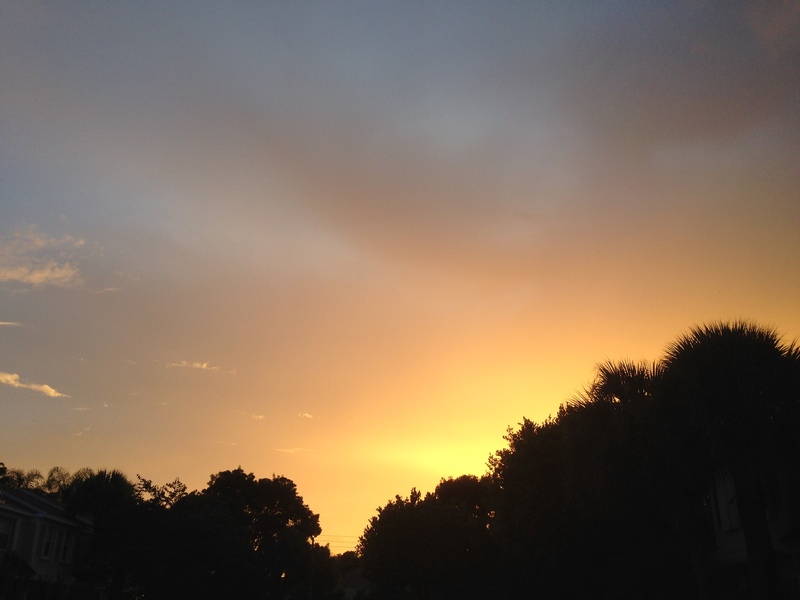 Finding something good about even the crappiest days can brighten the darkness. At least for me. I suffer from mental illness. I have anxiety and experience panic attacks. I have probably been depressed at some point because of this. There are times when my world feels very small and hopeless. There are days when I feel sick of it, sick of feeling anxious, sick of the physical symptoms of anxiety, just sick of not feeling like myself. When I am going through a particularly bad period it takes a lot of effort to function, it takes a lot of effort to go about my day and do the bare minimum. Before I had my son I worked at an office. It was exhausting to get through a day of work when I felt like a panic attack was looming all day long. For a while I saw a therapist and that helped a lot. In fact, I have never felt as awful as I felt when I started seeing her. My primary doctor prescribed a very low dose of Xanax which I took for less than a week. 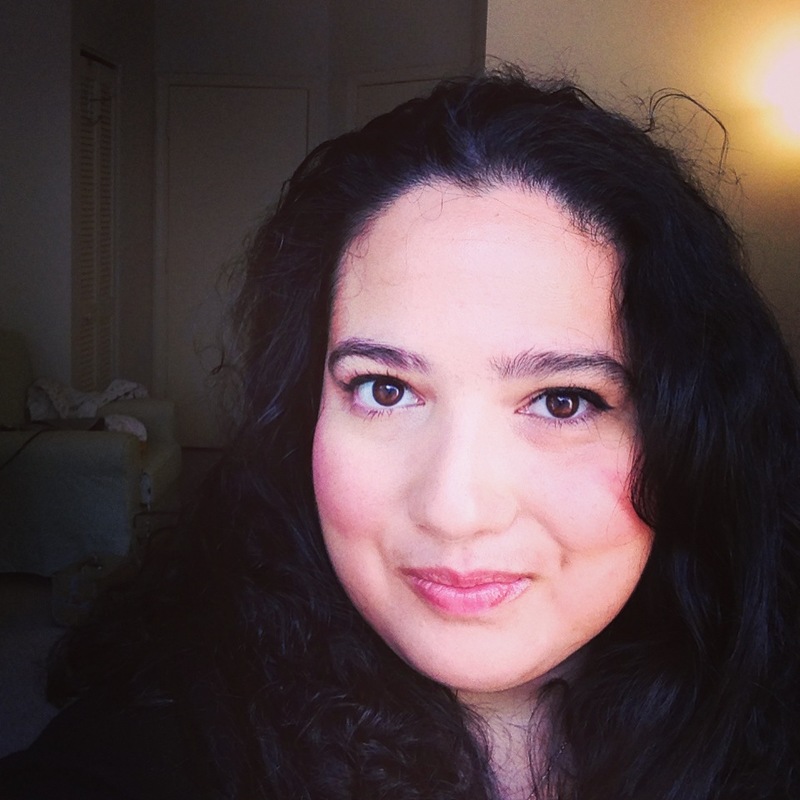 The fear of side effects made me more anxious and I didn’t feel that the pills worked at all. I was only too relieved to get rid of them. Medication is not for me. It might not make sense to others with zero personal experience with paralyzing fear or mental illness but medication was simply not for me at that point in time. What I have learned about mental illness is that there really isn’t a cure. For the past eight months I have been employing the techniques set forth in the book Freedom from Fear, and even though Dr. Liebgold tells you that you will be “cured” what he is really giving you are tools to MANAGE your illness. Even when I am feeling good I know that my anxiety is there. Lurking under the surface. There is a lot of ignorance regarding mental illness. As a sufferer I find myself surrounded by people who have no idea, no clue as to what mental illness is. It is still stigmatized and often treated in a blame-the-victim sort of way. Going to therapy and taking medication can help but they’re not necessarily going to. Some people try everything with little to no success. Which is why instead of questioning people’s mental illness we should all be supportive. Listen, offer sympathy, give a hug if appropriate. Suggesting that a person who suffers from mental illness is weak, defective, or not doing enough to get better is not only cruel and ignorant but also wrong. Similarly, when a sufferer succumbs to their illness we should not be calling them weak, cowards, or selfish. Robin Williams’ recent tragic passing has brought forth a lot of people who have expressed those things about him. He was not weak, he was not a coward, he was not selfish. Mental illness should not be considered any differently than any other disease. It should be treated with the same respect and seriousness. Mental illness takes lives. Suicide leaves behind a lot of hurt and sadness for the family and friends of the deceased but it is not fair to call the person selfish. How insensitive do you have to be to overlook the amount of pain and sadness that drove this person to decide that suicide was the only way out? I know that in the past I have made the mistake of suggesting that suicide is a selfish act. I was wrong. When you suffer from mental illness you often feel alone. I know I have. Let’s change that. Let’s talk about it. There is no shame in mental illness. There is no shame in being bullied, abused, or simply just confused. Talk to someone if you can, there is help out there. There is help here. 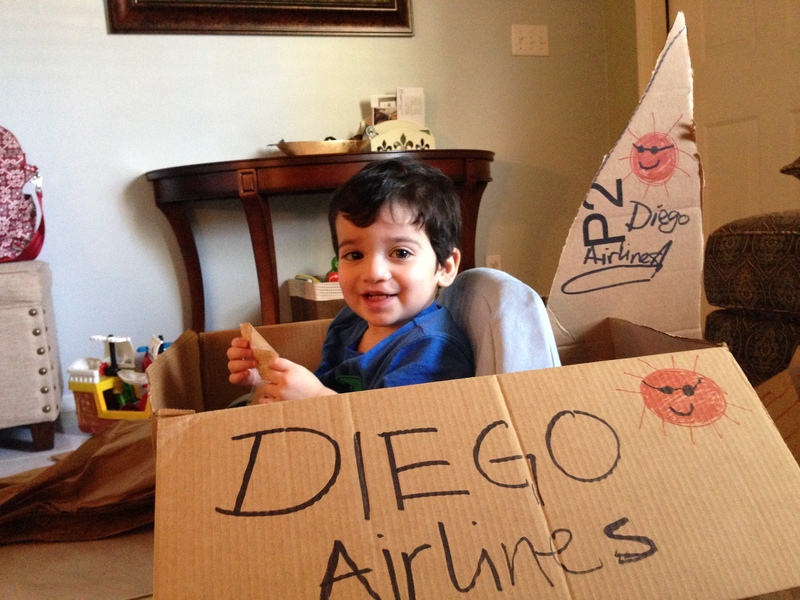 Diego is only two months away from his second birthday and he is not talking very much. He says mama, papa, dada, and no. He uses the sign for “more” and has even expanded his use of it to include asking for anything he simply wants. He will point and sign to me. He gets his point across. He can also shake his head no, and wag his finger no. It’s quite amusing. What is less amusing is knowing that by this age he is supposed to have a vocabulary of about fifty words. 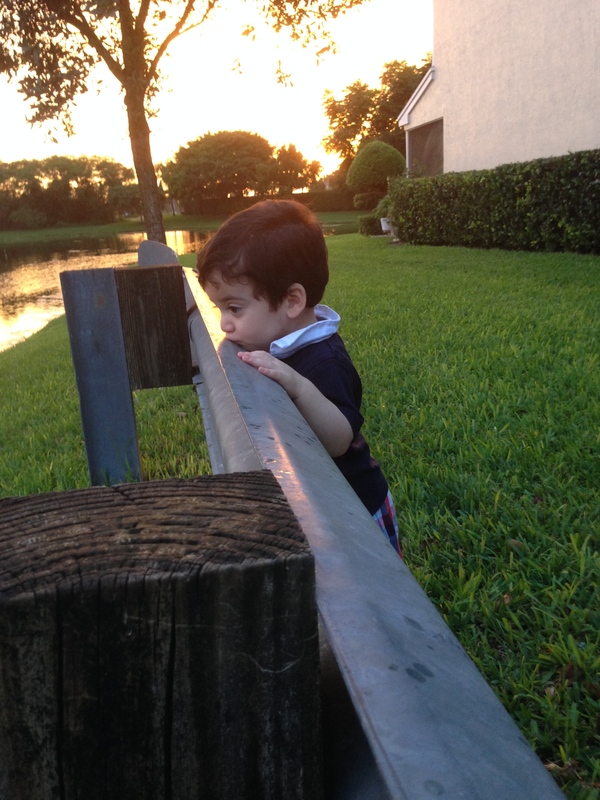 It is not uncommon for toddlers to develop outside the established norms and while these can cause unnecessary worry for some of us they also provide early intervention for others. 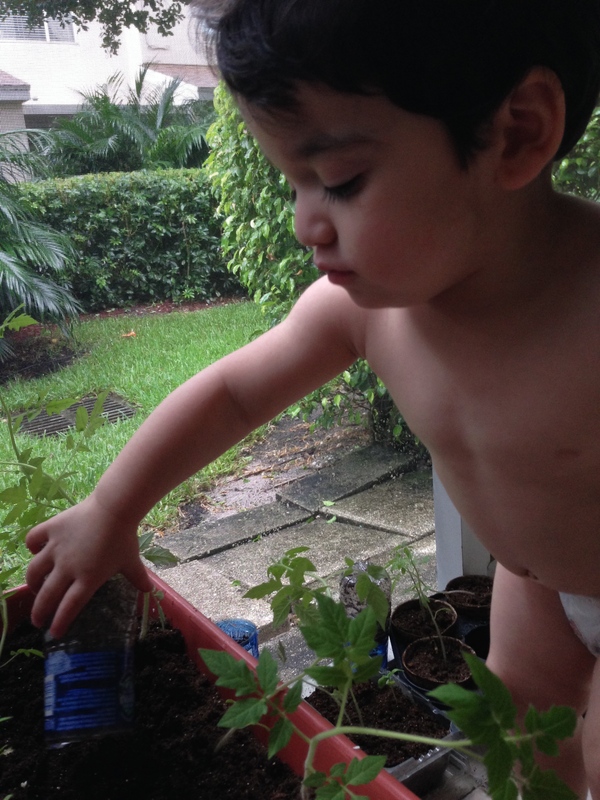 I am committed to raising a fully bilingual child. I want Diego to speak Spanish fluently, as a native speaker. I want him to read and write it as well. When he goes to school all instruction will be in English so he is more than well covered in that respect although I worry that he will be underestimated and discriminated against simply because Spanish will be the first language he learned. I will, of course, deal with that issue if it ever comes up but for now I am mostly interested in encouraging him to develop his speech. Like I said before, we speak to him in Spanish but he is exposed to English as well. I have read that this duality can cause children to take longer to talk but that by age five they are caught up and speaking two languages. There are days when I worry and question myself about his lack of speech. By all accounts my husband was a late talker and since Diego is a carbon copy of his father in every other way, perhaps he also takes after him with regards to this as well. During his next visit to his pediatrician I am sure this will be addressed should nothing change between now and then. I am open to any intervention deemed necessary as long as it will include Spanish as the language of instruction. Living in South Florida I do not anticipate this being a problem. I think it’s important for parents to leave pride aside when developmental delays are suspected or present. We do not help our children by denying them or ignoring them. There is no shame in requiring a little help and if parents show children that there is shame in it they are doing them a great disservice. Something that always bugs me about development in toddlers is that some parents want to make it about intelligence. If your child is a late talker he is not stupid, or less intelligent than a child who has a larger vocabulary. Intelligence manifests in different ways and to project our own insecurities onto our children is wrong. 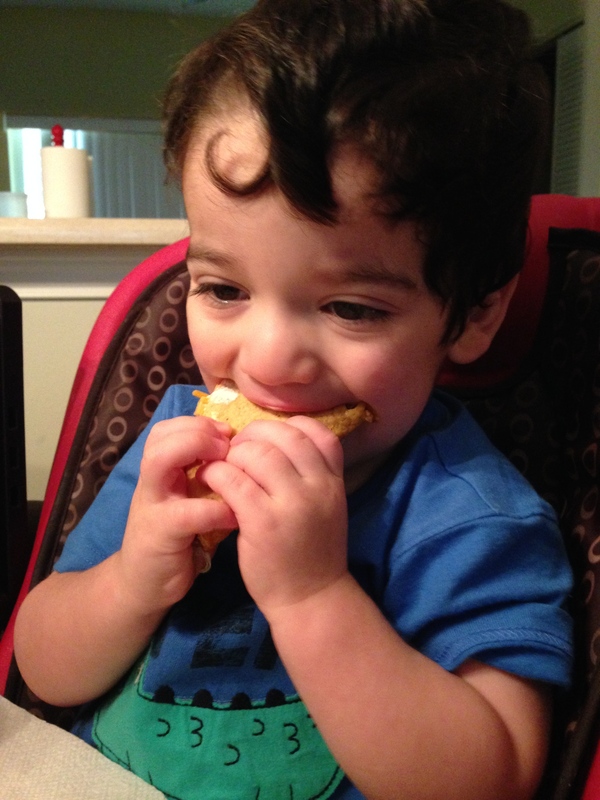 I have been doing a lot of research on speech development and have found some great resources. 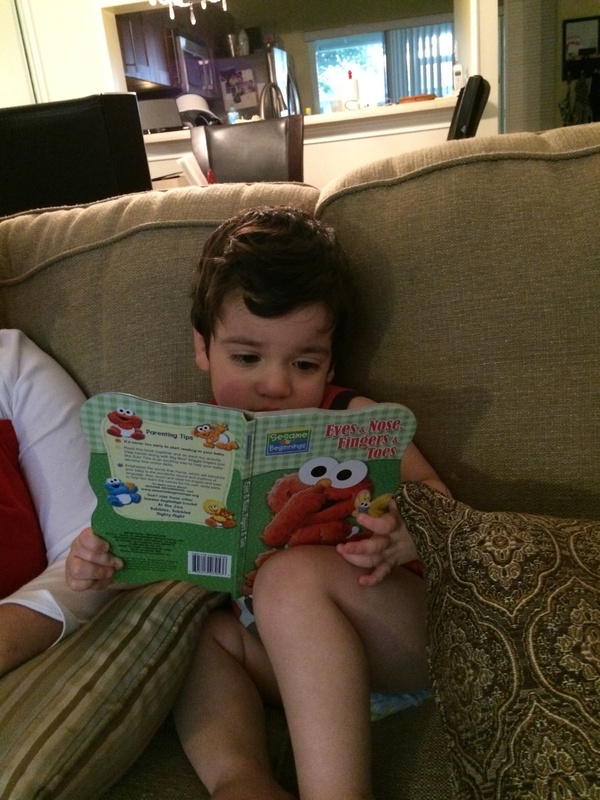 I have also started looking into Spanish language curricula for pre-school and beyond. Children spend about 8 hours a day at school, that’s only one third of their day! Education starts at home. Parents need to be involved and stay involved in order to give children the tools they need to succeed. I can already tell it’s going to be challenging (and fun!) 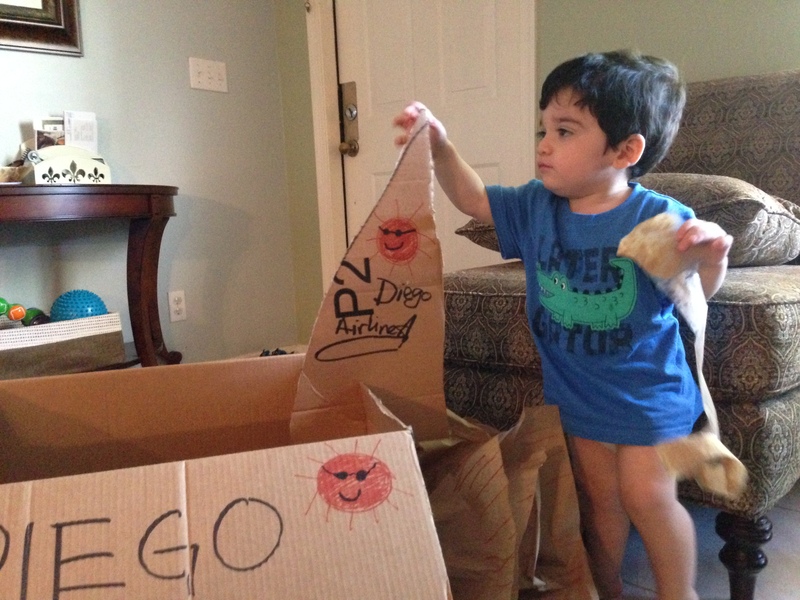 but I am committed to Diego’s education. If I want him to learn Spanish I will need to be a very active participant and facilitator. Finding materials to aid me in my journey is not easy but when I find something I feel like I’ve struck oil. My list of bookmarks continues to grow as does my list of materials I want to check out. I am still a disorganized mess but once I get myself sorted out I will share my findings here in case any one out there is as lost as I have been. I have been doing a lot of cooking lately and been in the mood to share the results as you can tell from my recent posts. Last week I had some of this crust dough leftover in the fridge along with some roast chicken thighs from the night before and I decided to combine these to make chicken pot pies. As I often do, I did not work from a recipe. I pulled out some mixed vegetable from the freezer and threw about a cup and a half into a pot along with a dash of salt and pepper, a little water, and a tablespoon of butter. I also added some celery seed and a bay leaf. Once the veggies were boiling I added the cut up chicken along with the bones (for flavor). I let this cook together for a few minutes and then strained the veggies and chicken, saving the liquid for the filling. In that same pot I added some butter and flour to make a roux. Once this had reached the desired color I added back the cooking liquid along with a splash of milk. Once it thickened I added back the chicken and vegetables (minus the bones and bay leaf). I had my left over dough rolled out already and I had cut around the ramekins I was going to use. I then spooned the filling into the ramekins and topped with the dough. I baked it at 375 for about 20 minutes. I was able to make three pies with the amount of filling and dough I had on hand. The results were delicious and it felt good to use up my leftovers and dough scraps. I would say that making the dough from scratch is well worth it but if you prefer you can always use store-bought. I find that the Pillsbury pie crust is decent, and before I started making my own crust it is what I used. Some people use cream of chicken for the filling, which is fine, but if you can make a roux and make it yourself. It’s not difficult and with practice it will be a cinch to make. Today I found myself with some crust in the fridge but no cooked chicken. 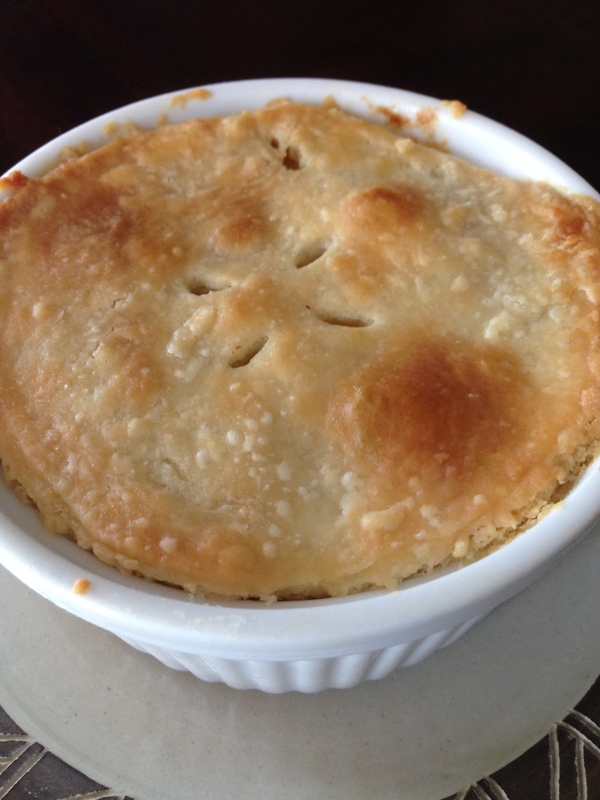 I decided to make pot pies again but I had to cook the chicken this time. I wondered if cooking the chicken on the stovetop would make a difference. I didn’t have a lot of crust so I only used one chicken thigh. I took the skin off and trimmed off the fat before separating the meat from the bone and cutting it into bite sized pieces. I seasoned the chicken with salt and pepper. Instead of discarding the chicken fat like I would normally do I decided I would cook the chicken in its own fat. I threw it in a pot and let it melt, I then added some chopped onion to the pot and let it cook for a bit. When the onions had softened I added the meat and the bone and sautéed it all together until the chicken had browned some. At this point I added one cup of water and let it all come to a boil and cook until the meat was done. At this point I added in my frozen vegetables. When the vegetables were cooked I removed about a half cup of the liquid in the pot and melted a tablespoon of butter into it. I then added some flour to this liquid and made a paste that I added back into the pot and cooked (adding a splash of milk) until it thickened (you can add some additional milk if the mixture is too thick). This worked out just as well as making a roux in the traditional way. My intention was to keep it to one pot without having to make an additional mess. From this point I proceeded exactly as I had before. I spooned it into my ramekins and topped with the rolled out dough. 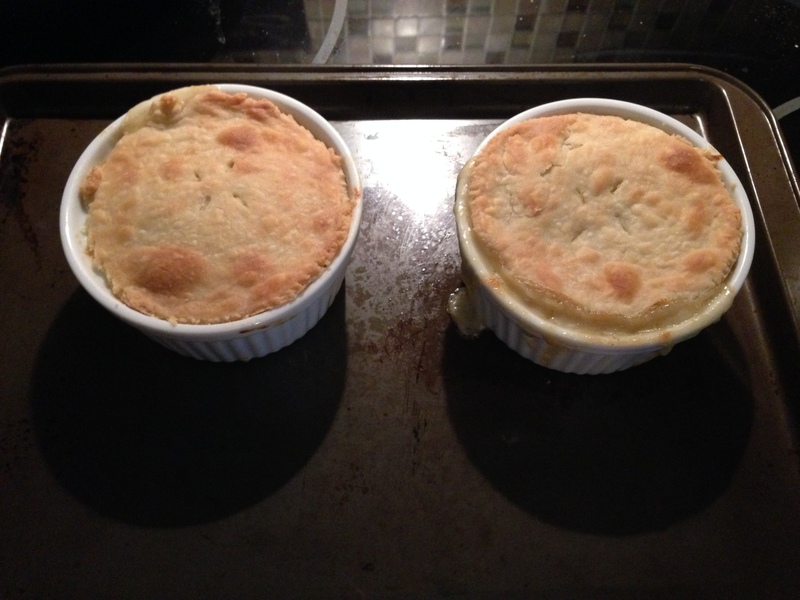 This time I only made two pot pies and they were just as good as the last. The flavor was not exactly the same but the flavor profiles were the same. 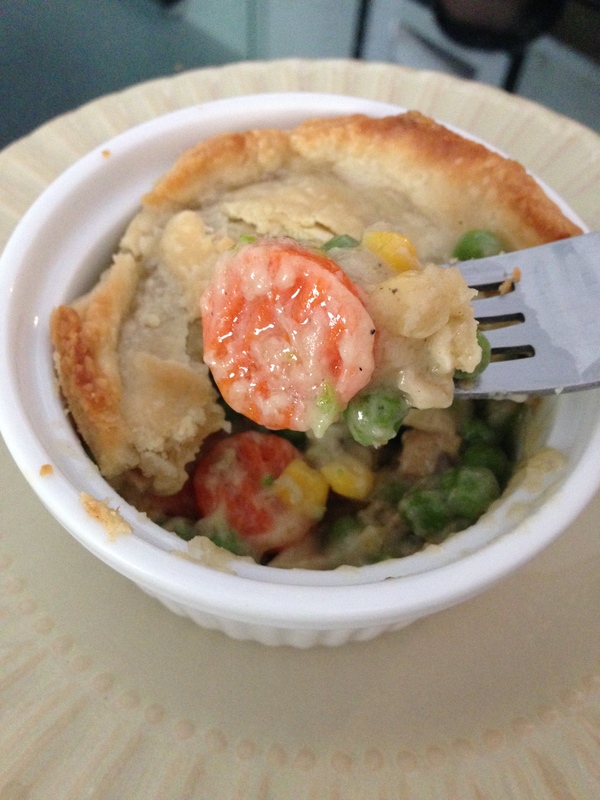 Whether you use left over chicken or cook your chicken specifically for making pot pies this is a hearty, easy to eat meal that won’t disappoint! 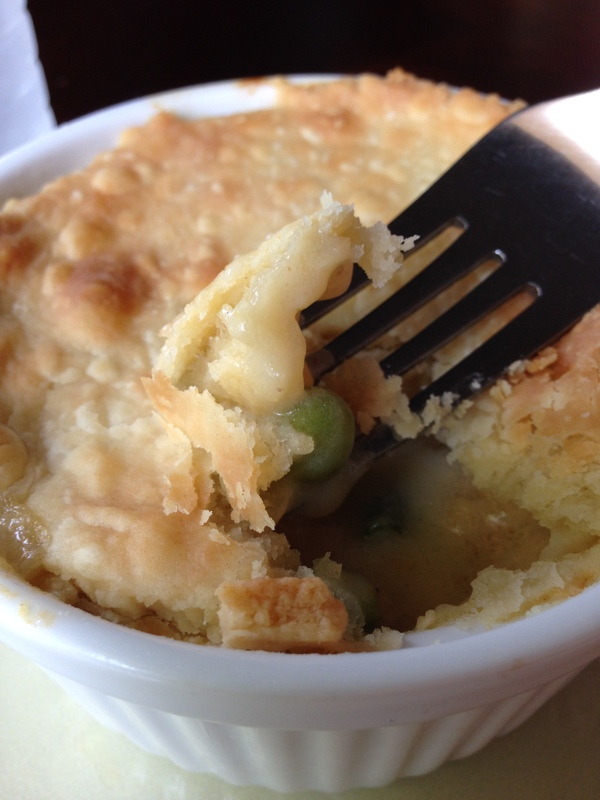 Posted in Recipes and tagged chicken, chicken pot pie, cooking, pot pie, recipes on August 5, 2014 by abbydlr.